Living in a heavily populated area such as Southern California, I do not have the treat of stepping outside to shoot my firearms. In my backyard I have a 20 yard bow range with 3D targets, but some days I just want to shoot my guns and smell the blissful aroma of gun powder lingering in the air. I could say screw it and blast off some rounds, but that probably wouldn’t be a good idea, so we’ll just scratch that one. Drive about 2 hours to BLM. Drive about 1.5 hours to the closest outdoor range. Drive a few minutes to the closest indoor handgun range. 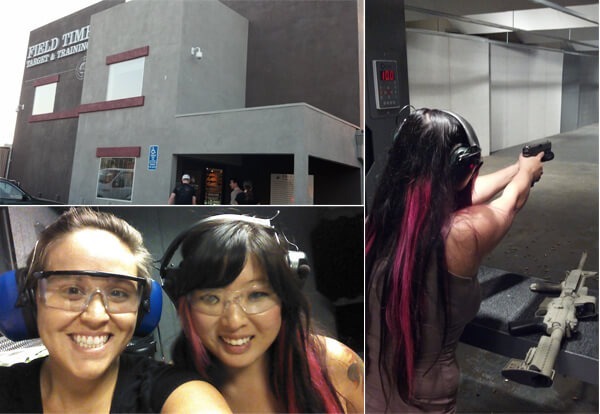 Drive 25 minutes to a new indoor handgun, rifle, and shotgun range. Wednesday afternoon on August 8, 2012 I rallied up my coworkers and their kids and decided we would try the new range (option 5). I guess I’m kind of known as the adventurer in the office… the girl who likes to shoot guns, hunt, scuba dive, and jump out of perfectly running planes. It’s always a great feeling when you take people who have never shot before because they get hooked! One advantage of me taking people is they look at how small I am and figure, hey if Catherine can do it, then so can I. I am pretty pint sized and girly. We drove to Field Time Target & Training (FTT&T) located in Stanton, CA. It’s nestled within an industrial area of Orange County. Surrounding the range are various manufacturing companies and machine shops. This was my second visit to FTT&T. My first visit was at their grand opening. They had phenomenal raffle prizes, discounts on membership, and an awesome sale on their remanufactured ammo. To date, I have purchased thousands of their rounds and I absolutely love their ammo for target practice. I have had no issues with their 9mm, .45 and .223. It is high quality and cheap. Recently having visited their booth at the gun show, they explained their ammo will hit the shelves with the “American Legacy” brand. I’ve included a photo below. * Tip: For every 500 round box of ammo you purchase you are entered in a raffle for a new gun every month. Check out their website to see the monthly giveaway. I understand why many ranges have poor attitudes. They are tired of the wannabes gangsters and idiots; however, that number of those types of customers is low (at least when I analyzed the ranges I’ve been to). A gun range is still a business. Their ultimate goal is to bring in revenue. I think most will find profits can be greatly increased when customers rent guns, buy ammo, and enroll in classes. If you put on this, “I know everything and you don’t so I’m better than you” attitude, your customers (generally male) are going to react with their prideful attitude in retort. Ask customers if they’ve shot a certain kind of gun that you have for rent, tell them about your ammo and classes, and spread the knowledge. After all, we are all gun enthusiasts, so why be rude. First time shooters are nervous. They don’t know what to expect. That is why the staff and customer support play such a huge role in helping determine whether people will return or not. You don’t want a bunch of rude pricks, because that really ruins the experience. FTT&T was exact opposite. Everyone was attentive to needs and answering questions. Their hospitality played a key role in ensuring my guests would return. From the person at the counter to the employees on the range, they gave excellent support. Many times I try to analyze whether I’m just being treated nicely because I am a female, but that was not the case. I noticed everyone received equal service. The employees on the range would walk up to people, start up conversations on their guns, help people, and sweep the casings. Their 21,000 sq ft facility is new, modern, and beautiful. I have not been into a range where everything is so “pretty.” From the décor to the room layout it is very nice. They offer a large gun rental selection from iconic handguns to tactical rifles. There are training classrooms upstairs, a storefront, large break room, and two range rooms. Each station has an electronic target system where you can easily program your own distances, similar to your car radio, to bring back and forth your target. There is a touch button for lighting amongst other features. Another benefit was the wide space from the shooter area to the back tables. So overall, I really liked this place. I’m actually planning to return to it tonight! I fully echo all your positive comments. There was only one guy behind the counter, out of several (and one female), who was walking around like a know-it-all. He appeared to be the one in charge of the closing shift, but that may just be because of his attitude. He strutted around for several minutes carrying a Desert Eagle and talking loud enough for all to hear about how his 500 Magnum was being fixed. He wasn’t doing a damn thing with the gun and finally when the lobby cleared out he put the gun back in the case. My personal thought is that there is just too much of that big-swinging-junk attitude in the gun culture. Thankfully, he was just a minor sideshow at FT3 (although I’m sure he thinks he is a main attraction). Other than that, EVERYONE was great. Top notch service, clean and safe environment, great selection and pricing, and a raffle for an AR15. FT3 clearly knows what they are doing and they are head and shoulders above nearly every other indoor range I have been to…and I am no stranger to shooting ranges. If you are an experienced shooter and want a great place to do your shooting or train this is it. If you are brand new to the sport, this is your place too. For full disclosure, I have absolutely no affiliation or relationship with FT3. I do not know anyone who works there, and I am not a member (although I am considering it now).